You are a spiritual being having a physical experience. Right here and right now. Along with tending to your spiritual wellbeing, it is crucial to also tend to your physical wellbeing. One activity that you can absolutely control is what you eat. Yes, you are what you eat! It really feels good to be conscious of what you put into your body. This creates a discipline which can also help you in other aspects of your life. The above photo is of zucchini, just starting to flower and these flowers are even good to eat. If you are thinking about starting to eat green, just do it! Green can encompass all healthy, clean foods not just vegetables. If you are worried that green foods are not going to be enough to sustain you, don’t. You can live on green foods and be healthy, even healthier than you have ever been. You just need to check the details and be aware of what you are eating. Experience this way of eating for a few weeks and see how you feel. Here are some ways to eat well and green that you might want to try. 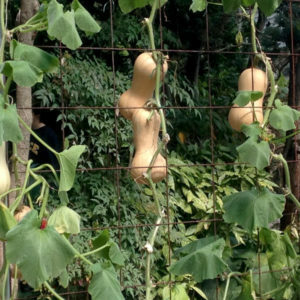 Here is a creative way to grow squash. From the beginning I want to emphasis how important it is to eat as organic as possible. There are so many pollutants in our environment that it is up to you to control their intake into your own ecosystem, your own body. We still do not know the complete effect of all the pesticides and other sprays that are used but there are certainly indications that these effects are not healthy ones. Why risk hurting your health by knowingly eating food that has these on them? At the very least, use a wash that cleans off the pollutants. Also, genetically modified just sounds scary! Best to stay away from those foods also. And of course avoid any animal product that has growth hormones such as the usual chicken or cow. The safest route is to eat pure foods – organic, free range and hormonal free. It just makes sense and your body will thank you for it! Filling your plate with plenty of hardy vegetables is healthy for you and will give you plenty of energy. Leafy greens are good for your muscles and bones. During the winter months, it is especially good to eat root vegetables, ie: beets, carrots, onions. Cook healthy meals at home. If you cook your own meals, then you have control again of what you are eating and putting into your body. You can create a family bond around preparing meals and sharing them together. Not only that, but when you eat at home and cook from scratch, you will save on energy and package waste. That makes it good for the environment and good for you too, since you can monitor how much oil, sugar and salt is being put on your food. You may wish to try a vegetarian diet. Here again you have to be very conscious of how you are eating. What is your new source of protein instead of meat? Tofu is easily available and tempeh is good for the colder months. You also need to continue to eliminate as much processed foods as possible from your diet. They contain toxins which are difficult for the body to digest. If you don’t want to drink milk, there are lots of dairy substitutes made from almonds, rice and coconut. Experiment and see what you like and how you feel lessening your dairy intake. It may reduce inflammation and colds for you. Our bodies can become too acidic when we eat bad foods and are stressed out. It is important to make a balance by ingesting probiotics and foods that are more alkaline. Which brings us back to those green leafy vegetables! Even just plain veggies are great, ie zucchini and peppers. Sea veggies are incredibly good. Try some sauteed seaweed in your stir fry. 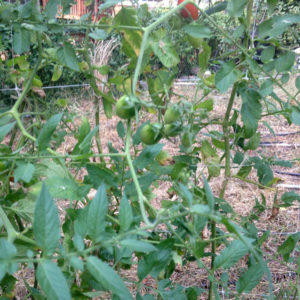 Avocadoes are filling and good for us also, as are tomatoes. The idea is to reduce inflammation as much as possible in the body. Ginger, garlic and turmeric help in this! Green tea instead of coffee can ease that caffeine jolt. Try the herbal teas that are available but make sure these are organic also whenever possible. Mint is good for the digestion while chamomile is very calming, especially when mixed with lavender. It smells wonderful also. Eat super foods that sustain you. You don’t need to eat junk foods when you have a craving. There are some really tasty foods that have the added bonus of being good for you, too. Snack on a piece of dark chocolate instead of a processed candy bar, or an apple and a slice of cheese instead of sugar filled pretzels. Simple popcorn is filling also. Some others in the super food list include nuts, granola, fruit, low-fat yogurt, rice cakes, and even kale chips. It is also fun to experiment with non gluten foods. We eat so much wheat that it is often helpful to stop it for a while and eat other grains, ie oats, amaranth, quinoa. Eating well and green means reducing the amount of processed foods you eat. You’ll feel better and more energized as your body is better capable of metabolizing non-processed foods. It will make you more aware of your body and which energizing foods it needs to eat to be at its best. This way you will be a strong physical vessel for your spirit to express itself through. Choose your food sources carefully and enjoy this culinary adventure.